Last Wednesday I ran an off camera flash shooting event with BH Photo on the High Line in NYC. The High Line is an old elevated rail that serviced the Meat Packing district that has been abandoned and turned into a walking park. It is a great Manhattan sight seeing stop. My event was sponsored by Expoimaging, and we shot small flashes with Large Rogue Flashbenders with diffusion panels attached. Here’s a gallery of images from me and a few other photographers from our day. We got fantastic results with simple equipment. 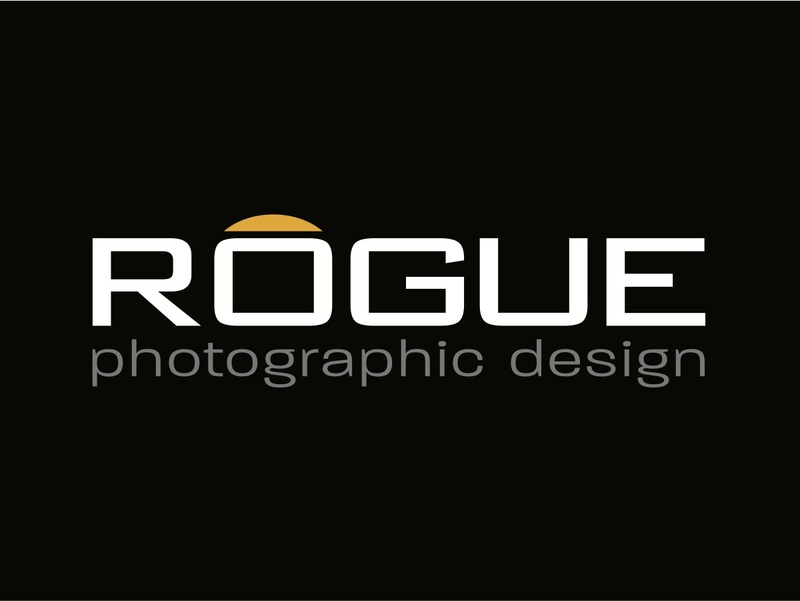 Be sure to check out all the BTS shots of the group using Rogue products. That’s it for now. Today I’m at EP Levine in Waltham, MA running a closed event for them. I’m really looking forward to this event next Thursday. If you are in the Boston area, join me for a great afternoon of learning and shooting off camera flash in the EP Levine Pixel Institute, which is a huge studio with a 30×30 white cyclorama. After a presentation, this turns into a shooting event with two models: Don’t forget your camera!! 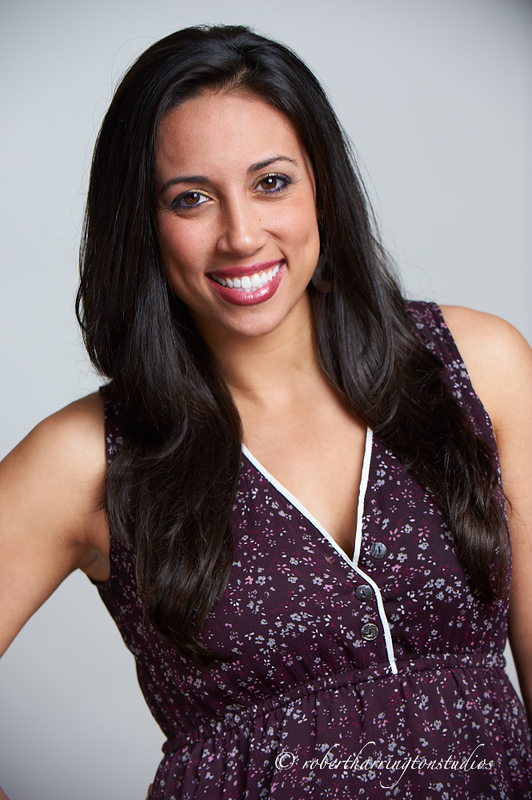 Here are a few quick raw to jpeg conversions from Saturday’s OCF workshop in NYC. It was a blast and we got some great images. Shoot through umbrella with reflector. Look for more NYC workshops soon! This Saturday I’m running a 3 hour workshop at Simple Studios in NYC. 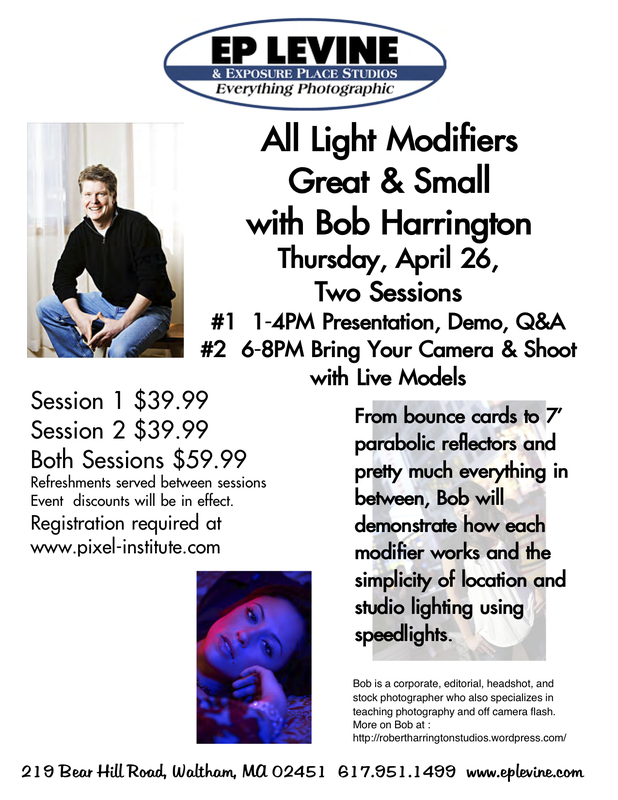 This is a shooting workshop, so bring your cameras and let’s use 6 simple lighting setups to get great results 6 different ways! We go from 2-5 in the studio and have a blast! This is a shooting event, so bring your camera and lens kit. You can register by using the Paypal link above. Come join me as spots are limited! I’d like to wish everyone a Happy Easter and Passover season. It is a beautiful time of year to spend with family and friends. Now the natural light portrait. 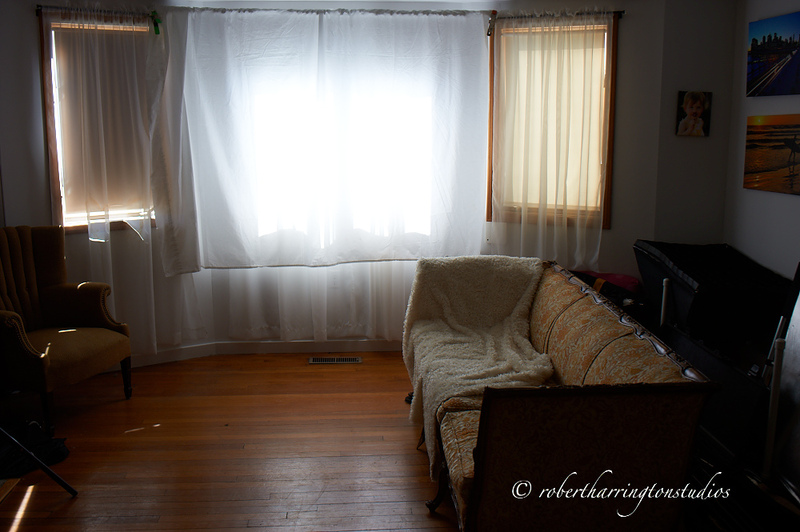 Even though I’m deeply involved in Off Camera Flash and regular studio lighting, I do use natural light. But you need to learn how to use and modify it for your need. The following images are direct raw to jpeg conversions without any processing. 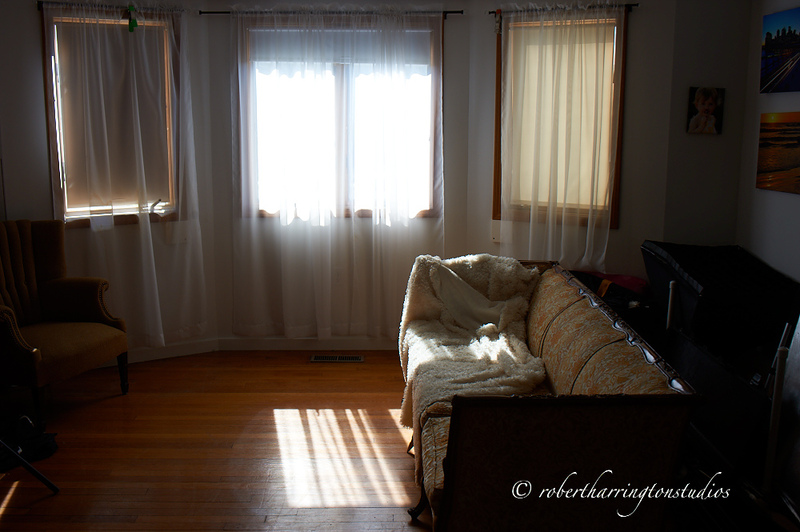 I want to show the direct, raw difference between modified light sources. By simply adding the sheet, I added diffusion and a softbox-type glow to the image. This is a more desirable result that I did simply and easily. So add a white sheet to your kit and you’ll be pleasantly surprised at the difference in your natural light photography. 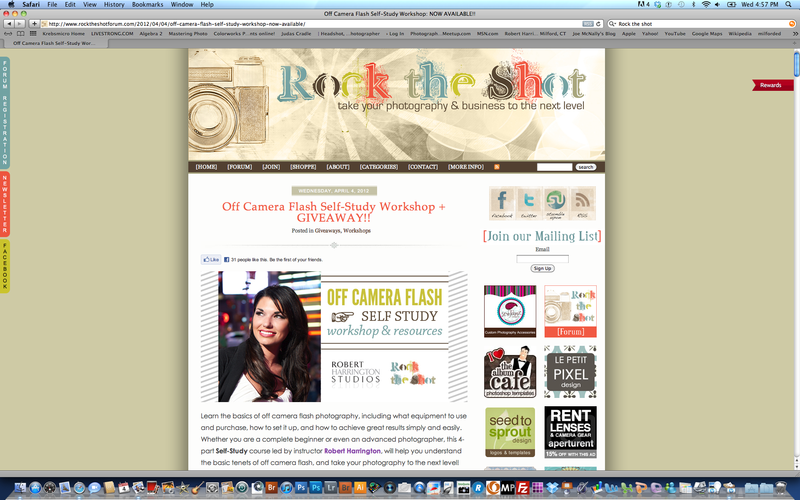 I’ve been busy, busy, but in between I produced a video training series for Rock the Shot. And now it’s available to the public. This is a fabulous 4 week self-study that is being offered for a great price and for only a limited time.